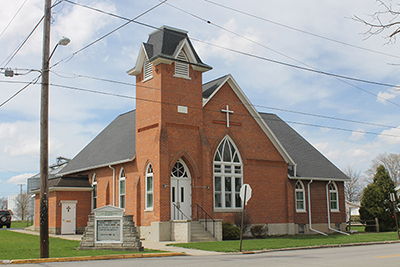 DELPHOS — Started as Sunday school offering in homes in South Delphos, St. Paul United Methodist Church members have now merged with Trinity United Methodist. Longtime member June Dunlap said the move was easy. Hulda Harter, a Methodist, and Mrs. Myers, a Presbyterian, were the driving force in the late 1800s behind the Sunday school offering. According to a history of the church compiled by Kenneth Ladd, after the school had a good start, it was suggested that they adopt a name and become affiliated with a church. The ladies chose the Church of the United Brethren. In the 1870’s, a small frame building was erected on West Clime Street. The building was one room. In 1899, the Radicals built the church on the corner of Main and Cleveland streets at the cost of $3,000. The Radicals prospered until about 1911, after which they no longer held services. With Radicals out of the picture, the Liberals bought the church for $2,000 and sold the frame church on Clime Street. Until 1920, the Delphos church was on the Lima Circuit. This included Harrod, Auglaize, Blue Lick and Delphos. In 1925, the Delphos church became a charge by itself. Many improvement projects have been completed at the church over the last century. The church is now used for a place of worship by a group of Hispanic Seventh Day Adventists.